Valentines day menu, click to enlarge and download. Left it too late to get in anywhere… fear not we are offering a second chance. We can’t wait for our Valentine’s Day meal. 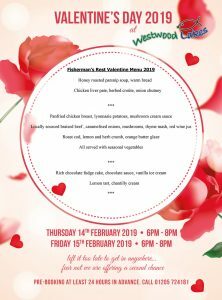 Please have a look at our wonderful Valentine’s Day menu. Delicious and luxurious food for a wonderfully romantic night out. Pre booking is a must at least 24hrs in advance. Please remember to check our facebook page for Events. If you like, you can check the attendance box to let your friends know you are coming.